i know this may not appeal to the purists out there..lol but this is my true symmetrical trooper helmet(s). or TK-TS (stunt) and TD-TS (sandy) for short. was a collaboration of artists, Patrick van Rooijen, George Evangelista and Gaurav Kumar to get this helmet exactly where i wanted it to be. as you can see they all did an outstanding job and accomplished what i wanted to do. also want to thank my friend Carsten for input. he was a big help in achieving this as well to give this helmet that look and "feel" of the original ST helmets. we went to extreme lengths and processes of combining both sides of an original ST helmet to the point where it is was symmetrical. and matching every detail and aspects of the helmet to create a stylized, true accurate symmetrical ST helmet. you might be wondering how we did this. well, what we did was, instead of doing a mirrored symmetrical helmet. or taking the best bits and pieces and details of a helmet. we did a true symmetrical helmet where we took images of a film used helmet and ran them through a program where it combined both sides to make a true film accurate symmetrical image of the helmet. and then the artist mimicked what they saw in the images for the digital sculpt. the end result is what you see here. there are still a couple of tweaks that need to be made. but for the most part it's done. and i plan on adding the functional details they gave to the decals of the R1 helmets. but keeping them true to form of the OT. ill post final images once that is done. hope you guys like it. Last edited by DynamicMenace on Sat Jan 21, 2017 12:49 pm, edited 6 times in total. All your and your modeler's hard work has really paid off. Glad my contribution helped without becoming obnoxious, as I'm sometimes known to be, but utilizing the same average symmetrical method I've been advocating for years really creates a fantastic looking piece that doesn't look Frankensteined together. Really glad I advised you on that and it shows. yes Carsten your input was very helpful for my vision of what i wanted to accomplish for this helmet. 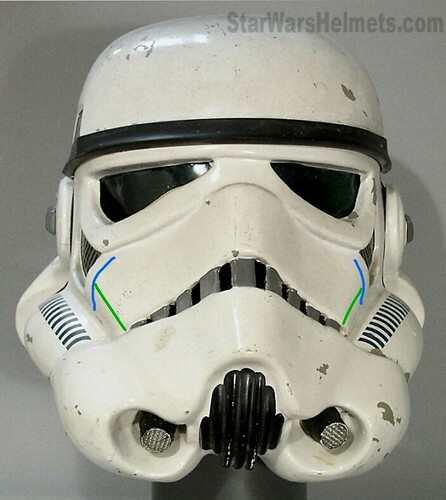 i can say it with pride that this is an accurate true symmetrical trooper helmet . I'm not a real fan of "sanitized" stormtrooper helmet. But this one looks damn cool (way more than MR helemt or Rogue One porudction prop). Nice work. If only they followed this way for Rogue One!!! Yes, Yes, Yes ! That's the way to do it. Retains the OT look and character completely. Nice job guys. Can you show the 3/4 view that shows the angle of the far cheek line (from tear to tube) alongside the center line (from top of nose to vocoder)? In some TK helmets they are almost parallel, in others the slope of the far cheek line is greater (particularly on the right side of the helmet as it's worn). That slope could depend in part on how each particular helmet was pulled off the mold, and also on the camera distance. wow, thanks so much everyone, really appreciate it. although there are a couple of tweaks that need to be made. it's great to know that what i set out to do was accomplished. i think putting TS (True Symmetrical) after TK and TD would work best. so, TK-TS and TD-TS. and sure, i just added some 3/4 profile views to the initial post. now, keep in kind, these are true symmetrical helmet. meaning we took ALL of both sides of the helmet and ran them through a program where it combines boths sides to achieve true symmetry. so things may not line up exactly to an OT helmet that is asymmetrical. Sounds like a fine naming convention to me! Thanks for extra pics. So far I get the right OT vibe from every view. The far cheek does look a bit rounded, but probably just from that angle. At a 45 degree rotation, it likely will look more like an upside down L-shaped hockey stick. Understood about things not lining up. Heck one wouldn't be able to line up any two of the original screen-used stunts either. I have several HDPE Dan Laws helmet kits, which I believe have an accurate shape off the mold. But like the original stunt helmets that shape can be tweaked in constrained ways, intentionally or unintentionally. I had embarked a few years ago on trying to compare the RS helmet to the "average" TK screen-used helmet. I ended up instead finding what troopermaster agreed was the RS helmet. I've always thought the RS face was a bit flatter, the frown a bit taller, than the average TK. This look was carried over to the ANOVOS helmet I believe as well. I did create a 3D model of my ANOVOS helmet using Autodesk 123d Catch. A crude inaccurate capture to be sure. I respect the amount of work that you guys put into creating the TS model and the methodology of incorporating many views from a variety of helmets to achieve it. So when shall we expect to see a Vader model derived from screenshots? I've always thought this was possible, but technically much more difficult because of reflections and fewer stationary details that can be tracked frame-to-frame. ANH probably the most amenable to such processing, ESB the least. well with copies of copies things do tend to loose detail or shapes alter. but the overall shape or silhouette remains for the most part. nice job on the model. looks great man. well as far as Vader, its not that difficult from the front view. at least with the poster helmet. but as for me, i actually liked the new design for the ROTS Vader helmet, and here is why, to me, it look as a younger version of Vader. so it should have all the shapes and details or even the feel of the ones we see in the OTs. to me it captures the youth of Vader , the beginning of what's to come. .
so for me, the new design worked perfectly for the occasion. but on a engeneering synthetic advanced technological universe, a true symmetrical Vader helmet would be ideal. as you can see below, even the symmetrical Vader has the same look and feel as the OT version. Fantastic work, DM! Seriously, why can't the "professionals" get it right like this?? yeah, the name is fitting. been following this on RPF, but better forum here, my comments still apply. print a master tool, and vac form a few for us..... artistic license, more than 10percent difference, etc..... kits please!!!! !